Posted on 02-17-17 at 3:56 p.m. I will continue where I left off last week with more commentary on the Trump administration. This time, I am turning my attention to the men nominated to head the Environmental Protection Agency (EPA) and the Department of Energy, Oklahoma Attorney General Scott Pruitt and former Texas governor Rick Perry, respectively-two ardent Republicans whom I find intriguing. When Mr. Trump announced their nominations, the American media decried their climate-change skepticism in light of their incipient responsibilities. Both men defended their positions, saying that they didn't totally deny the impact of human activity on climate change, but that it has been greatly exaggerated and that the science is far from conclusive on the subject. (More here). During his campaign, even Mr. Trump publically stated on Twitter that "the concept of global warming was created by and for the Chinese in order to make U.S. manufacturing non-competitive." Again, while we frequently hear these kinds of opinions emanating from the United States, I am very surprised that a significant proportion of Canadians share this point of view. Almost one in four Canadians (23%) believes that if the climate is changing, it is Nature's way and not dangerous for the Earth, and rejects the idea that climate change is caused by human activity. Nevertheless, about three out of four Canadians (77%) support the contrary view. Also very interesting are the regional variations and demographics associated with climate skepticism. Alberta has the highest proportion of climate skeptics, at 35% of the population, with the lowest levels found in the Maritimes (15%) and Québec (17%). 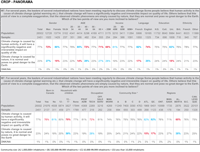 Men, people 45 to 54 years of age, low-income earners, technicians and people without a university education are the groups with the highest levels of climate skeptics. There is obviously an economic factor underlying these finding. Feeling economically vulnerable has led these Canadians to filter the scientific information presented to them via abundant media coverage, and to take refuge in a less threatening point of view. Here too, as I suggested in my lead, money (financial considerations) trumps (the scientific) facts. As we know, much of Canada's GDP depends on fossil fuel, the main culprit of climate change. Those most convinced that human activity is responsible are the ones arguing for conversion to alternative energy sources, which would negatively impact jobs and economic activity in regions dependent on fossil-fuel industries. Mr. Trump understands this very well and has used it for political gain. When we look at the personal values and mental postures of these climate skeptics, we find that they have a very conservative profile, dominated by a very Darwinian view of life today. They see the economy as a pitiless jungle where anyone can be thrown out at a drop of a hat, where you need to fight constantly to keep your place. Their conservatism is a self-protective reflex to make them invulnerable to information perceived as threatening. How do you expect the country comes to terms with Alberta's anti-climate-change policies if a third of its population refuses to believe in climate change and feels economically threatened? Ditto for the country as a whole if every time we want to move ahead with alternative energy policies, one in four Canadians feels threatened. 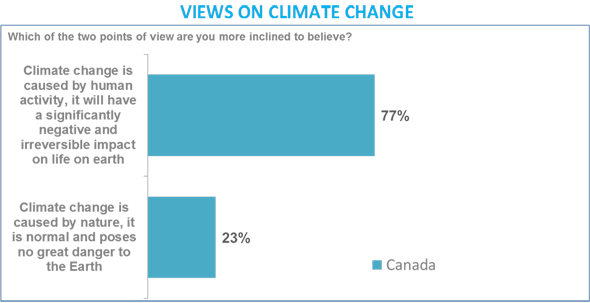 Too often, the public assume that energy policies addressing climate change will take a heavy economic toll. A strategy to retrain and relocate the workforce needs to be at the centre of any energy vision (to mitigate the impact of the carbon tax, pipeline regulations, the development of green energy, etc.). Education and dissemination of scientific knowledge should also be included in these strategies. I believe it is imperative for companies to be socially engaged, to play a key role in supporting the communities affected by energy strategies: with training and relocation of labour; with the education need to support multiple socio-community initiatives. I believe we should view these findings as an opportunity for social and community action, rather than an opening for the kind of populist politics on display by the new American administration! As I discussed in my first blog post, Wagner's opera, Das Rheingold, is a good illustration of this societal phenomenon, although in reverse, in that it represents the majority view (human activity as the cause of global warning). Wagner's epic work, Der Ring des Nibelungen (The Ring of the Nibelung), can be interpreted many ways. But we can certainly give it an ecological interpretation. The Rhinegold in this narrative is a unifying life force, one that regulates harmony with the cosmos. The theft of the gold by the dwarf, Alberich (the Nibelung), jeopardizes this balance of life and nature, just as humanity's carbon footprint upsets the planet's harmony. The video clip shows us the theft of the gold in a production by Robert Lepage at the Met in New York in 2010. I see it as a metaphor for Man's excessive consumption of the planet's resources. (According to Global Footprint Network, on Monday, August 8, 2016, humanity had exhausted all the resources that the planet can renew in a year, and was therefore operating an ecological deficit for the rest of the year! Wagner: Das Rheingold, James Levine, The Metropolitain Opera, produced by Robert Lepage, New York, 2010, Deutsche Grammophon. Posted on 02-10-17 at 8 a.m. I have always been fascinated by the promises and expectations that come with new political administrations, particularly in Washington, D.C. But this year’s program is off the charts—and has got off to a roaring start! Aside from all the controversy surrounding the first days of this new administration, the personalities of Mr. Trump’s team deserve a close look. While no one’s role should be discounted, one especially colourful character is Ben Carson, Trump’s secretary of the Department of Housing and Urban Development (HUD). Dr. Carson, an eminent, retired neurosurgeon, had a long and accomplished career that earned him the highest professional distinctions. However, in politics, he has emerged as nothing short of distinctive. An ardent Seventh-day Adventist, he loudly proclaims his faith and his belief in creationism—a theory that maintains that life on earth was created by God in six days, as stated in the Bible—and considers the Big Bang theory and Darwinian evolution the work of the Devil! While it may be surprising to hear this kind of position in the United State, the extent of these same beliefs in Canada is astonishing. A CROP poll revealed that 40% of Canadians believe the Biblical version of creation in six days over Darwin and other theories of evolution! I’m stunned by the magnitude of this phenomenon: that’s two out of every five Canadians! When we drill down by province, we find some regional variations: Québec and British Columbia number the fewest creationists (36% and 33%, respectively), while the most believers in the literal Biblical account are found in the Maritimes (49%) and Prairie Provinces (55%). Still, even in the most “skeptical” provinces, creationism represents the views of about one in every three individuals! The sociodemographic findings come as less of a surprise. As one might expect, the Biblical account has more followers among older people (65 plus), residents of smaller towns or rural areas, and the poorest and least educated in the country. 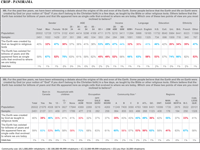 Even among Millennials (18 to 34 years of age), one in three (34%) is a creationist. Frankly, our team was astounded by these findings. In an era where knowledge has never been more widespread, where information circulates freely and instantaneously on a multitude of platforms, this level of adherence to the Biblical version of creation is a tad shocking. However, I believe it is more productive to try to understand the socioeconomic and sociocultural conditions that lead people to such beliefs instead of judging them. Our era is not easy for everyone. Some find the challenges caused by the social and economic transformations harder than others. We know that believers in biblical creationism have great difficulty adapting to modern life and its risks. These individuals feel overwhelmed by the world around them, under personal threat, at a loss, without references to guide them. The founding myths of our Judeo-Christian culture provide them with the comfort of meaning and certainty in the unsettling times they have to deal with. One of most defining characteristics of creationists is how much they respect the traditional authority of institutions and leaders. In response to troubled times, they support strong, authoritarian leaders who can redress the situation. Populist political speeches telling them they’ve been abandoned by their institutions resonate with them. This is a theme of the new American administration, which was elected on a populist platform. Neither Canada nor Québec is immune to these political trends. I sincerely believe that bridges need to be built to include populations having trouble adapting. Revaluating our democracy and institutions should be on the agenda of all parties on the social stage who are able to contribute to the conversation. A more inclusive vision and strategy for all citizens, especially those who feel left behind in the wake of current economic and technological disruptions, should be on the agenda of all public institutions in the country, as should initiatives of corporate social responsibility. Otherwise, we’re headed for political upheaval! What better way to illustrate the theme of the origin of the universe, the world and life itself than with the overture to Wagner’s opera, Das Rheingold, which introduces Wagner’s epic tetralogy, Der Ring des Nibelungen (The Ring of the Nibelung). The orchestral overture to The Ring’s first opera expresses the birth of the universe. The first murmur in the void before creation, in muted E flat major, gives way to the world, to life, as the music grows in power to celebrate the arrival of the living. The video clip I have selected comes from a performance of the opera in Valencia, Spain. The Ring was staged like a science-fiction movie, projecting the action in a faraway galaxy. As you can see, to illustrate the idea of the void before creation, Zubin Mehta conducted the orchestral opening in total darkness using a glowing red flashlight for a baton! You may find five minutes a little long for a video clip on a blog, but the music is absolutely glorious. It is, after all, the creation of the universe. Something that took God six whole days! Wagner: Das Rheingold, Zubin Mehta, La Fura dels Baus, Valencia, 2007, Unitel Classica. Posted on 02-10-17 at 7 a.m.
Full disclosure—I have two passions that continue to affect me deeply: delving into the social phenomena and markets that typify our era, and music, especially opera. In coming weeks, I will share these passions with you and reveal what excites me. My colleagues and I have the opportunity to study phenomena that define today’s world. Despite the uniqueness of some of these phenomena, they still contain a universal, timeless quality, especially for Western cultures and markets. Music, particularly opera composed since the Romantic era, also expresses universal and timeless themes. My posts will therefore attempt to make connections between our present era and the exceptional heritage of Western music. In these posts, I will also share my reflections on the challenges we face today, in the hope that they will inspire your actions, your orientations and, ultimately, your strategies. You can follow my posts on Twitter (@alaingiguere) or on LinkedIn. I fervently hope that you will feel as passionate about these posts and musical excerpts as I do, and that you will be moved to buy the full musical piece to enjoy later! P.S. All my tweets and posts will be published in both French and English. Posted on 02-03-17 at 10:57 a.m. The results of CROP’s latest monthly survey on the political climate in Quebec are hot off the press. The survey was conducted from January 11th to 16th, 2017 among 1000 panel respondents. Posted on 12-15-16 at 3:05 p.m. The results of CROP’s latest monthly survey on the political climate in Quebec are hot off the press. The survey was conducted from December 7th to 12th, 2016 among 1000 panel respondents.